With releases on high profile record labels such as Elektroshok, iBreaks and V.I.M., New York City based Wavewhore has established himself as one of the USA’s leading breakbeat producers. His skills behind the decks have also led to headlining appearances across the US, Europe and Asia as well as a long-running residency at New York City's legendary Sullivan Room in Manhattan. In addition, his music and DJ performances have been featured on many of the world’s top broadcast media outlets including BBC Radio 1 London, WKTU 103.5 FM New York, KISS FM London, RTE Dublin, Sirius Satellite Radio and MTV. 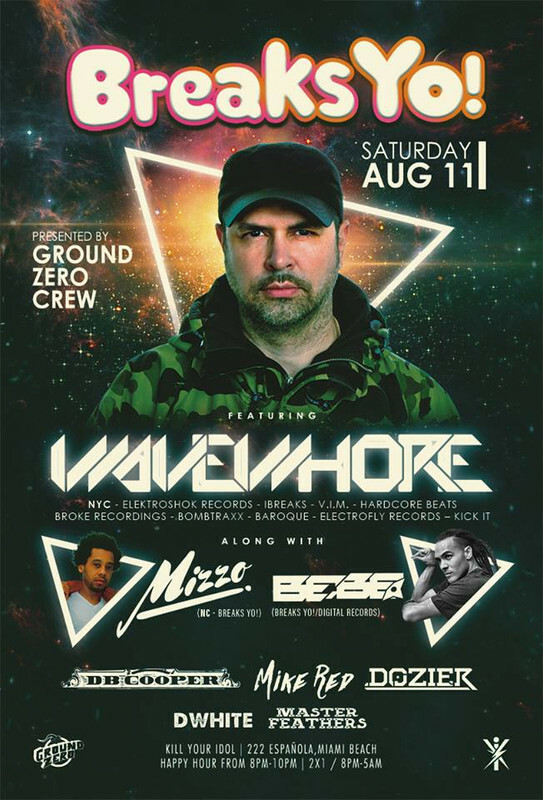 Wavewhore has been called a “breakbeat master” by Liquid Todd (Sirius Satellite Radio) and “one of the USA’s finest breakbeat DJ/producers” by Jay Cunning (KISS FM London) while Breakbeat Online described him as “NYC’s finest export since the Beastie Boys”. His music has also received high level support from many of the top names in the business including Aquasky, DJ Icey, Jackal & Hyde, The Freestylers, General Midi, Elite Force, Annie Nightingale and many more. In the studio, Wavewhore is also focusing on genres such as bass house, glitch hop and electro and is currently working on several projects which build on his early production work of drum'n'bass and contemporary dub. These additional musical ventures will continue to feature his signature high energy beats and bass lines combined with the quality production and impact that have led to Beatport Top 10 chart listings and a global following. Breaks Yo! is a digital music label and monthly event series based in Miami which aims to bring nu breaks to the forefront!